"World Class" a thrilling book! 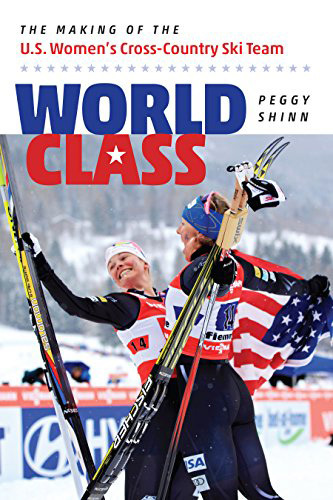 "World Class: The Making of the U.S. Women's Cross-Country Ski Team" is a new book about the rise of the US Women's Ski Team to world-class status. Peggy Shinn has written a thrilling account of the origins of cross country skiing in in the US in general and the US Women's Cross Country Ski Team in particular. Having begun cross country skiing in the early seventies and ski racing in the 1977, reading this book was like reliving my life experiences in skiing. Beginning with Trina Hosmer, Martha Rockwell and Allison Owen, and carrying through Nina Kemppel, Wendy Wagner, Rebecca Dussault up to Kikkan Randall, she covers the struggles of both coaches and athletes on the race course and for funding within the United States Ski Association. Having attended some of those ski meetings, I can feel for them and the coaches, beginning with John Caldwell and Marty Hall. I remember hosting Kevin Brochman, his wife and Wendy Wagner one Sunday after the North American Vasa while on their way to ski races in Chicago. Money was always scarce and success depended on friends in the skiing community. But as we all know hard work and determination by dedicated coaches and athletes have led to a team of US women that has the respect of the world. Shinn traces the rise of this group beginning with Kikkan Randal's lonely campaigns on the World Cup circuits. These experiences made her realize that the US needed a team and Peggy gives much of that credit to Kikkan. Her coaches, Matt Witcomb, Chris Grover and Jason Cork also recognized the need and together they melded a group of individualist into a real team. Kikkan led the way with multiple World Cup Sprint titles and new skiers realized that success was a real possibility. Holly Brooks, Liz Stephen, Ida Sargent, Sadie Bjornsen, Jessie Diggins and Sophie Caldwell have enjoyed World Cup success and given us all joy in watching them achieve success. Peggy documents this exciting rise to World Cup and Olympic success in an exciting narrative. While the book ends prior to the Olympic Gold medal that Jessie and Kikkan won we all know what was coming when the book ends and maybe it adds to the anticipation. This book is a great read for any sports enthusiast let alone a cross country ski racer. Relay Socks and Glitter. World Class: The Making of the U.S. Women's Cross-Country Ski Team is available in both Paperback and Kindle editions on Amazon.com.